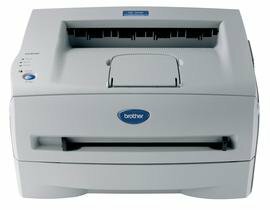 Brother HL2040R is a model of the black and white laser printer, A4 format. Has at its disposal a great average technical data. Resolution it is 2400 x 600 dpi. Print speed, also at a height of up to 20 pages per minute. At that time first fingerprint only 10 seconds. Dimensions standard 371 x 166 x 361 mm, weight slightly too big for 7 pounds. So your Brother printer HL2040R, easily fit both for an office and for home use.